It appears that I have been a little MIA – it’s been nearly two months since my last blog post! Although I haven’t been writing blog posts, but I still regularly update my Instagram with my dining adventures – follow me at @mydiningjourney. Whenever I’m in Howick for brunch, the go-to cafe for my friends and I have always been Howick Village Cafe. So when my friend mentioned about Urban in East just around the corner, I thought it was new! Turns out, it’s been there for a good year, so we decided to check this place out. Urban in East offers a selection of breakfast and lunch items on the menu as well as sweet treats and sandwiches in the cabinet. 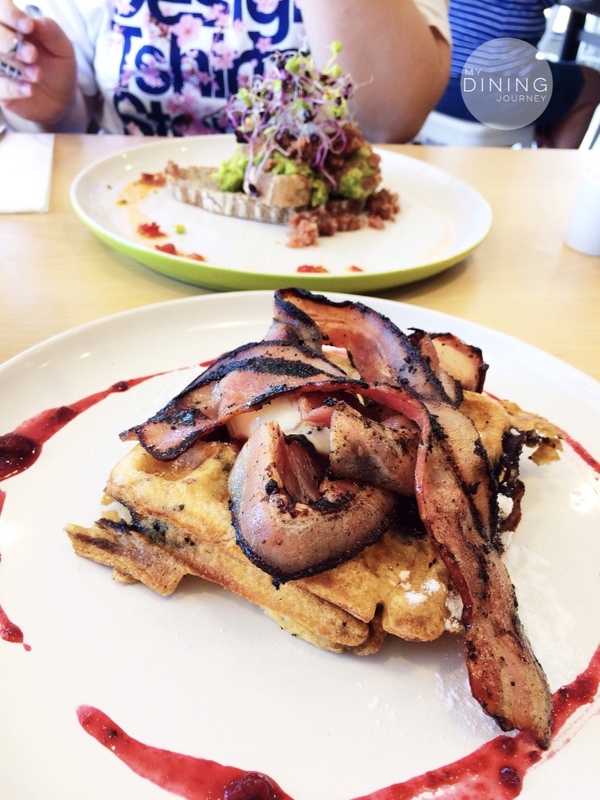 I opted for the blueberry waffles with creme fraiche and crispy bacon which I must admit was disappointing. The waffles were undercooked which meant the texture was too soft for my liking. Flavourwise, it was enjoyable and I had plenty of bacon to share with my friends. The smashed avocado with poached egg and bacon jam on toast was happily ingested by my dining companion. I managed to steal some of the bacon jam which was rich and smokey. The highlight of the meal would have to be my friend’s Chef Salad. Initially, she was disappointed that they had run out of the Market Fish, but the chef came out and recommended the Chef Salad instead. 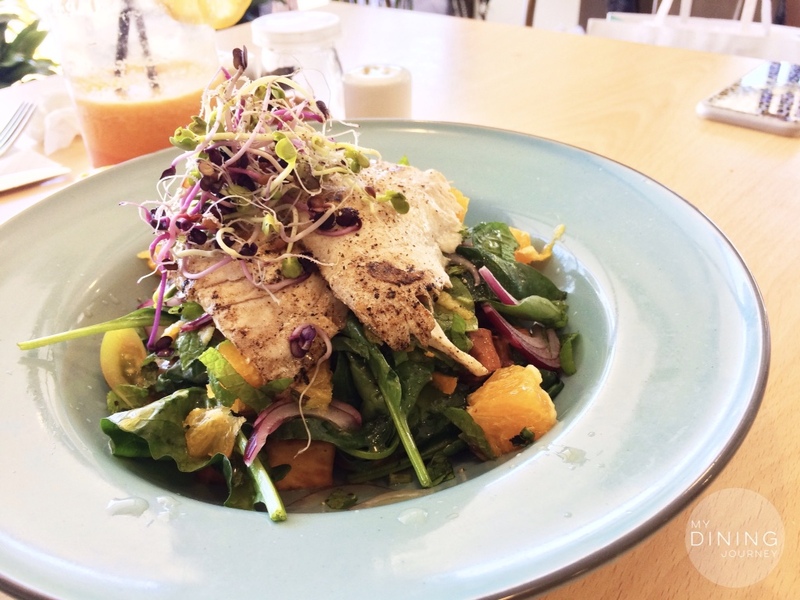 Served with beautifully grilled fish, fresh salad greens, tomatoes, roasted kumara and oranges, this dish was refreshing with just the right about of tang. Our overall brunch outing at Urban in East was enjoyable. The dishes were all Instagram-worthy – colourful and beautifully plated – reminds me of those fancy cafes in Central Auckland. Service was friendly and efficient and the ample off-street parking meant we started our meal in a good mood. If you’re in the area, pop by Urban in East and tell me what you think! 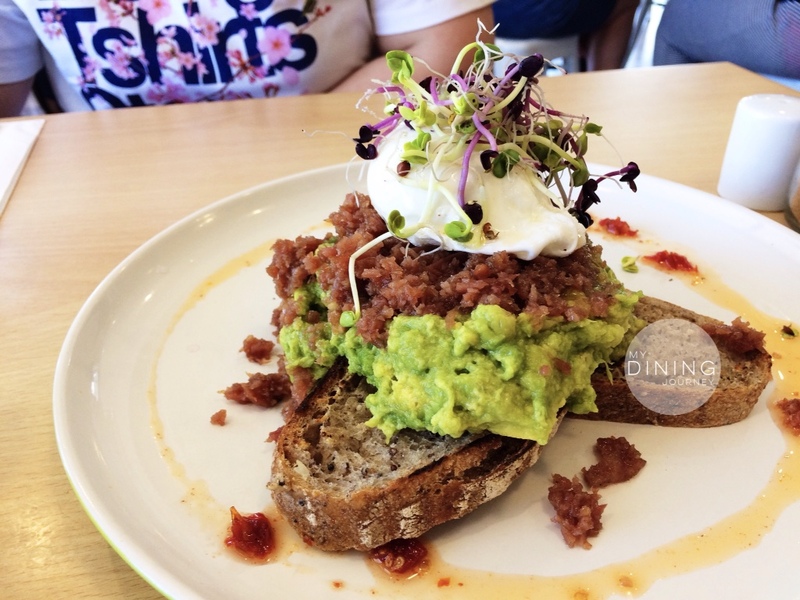 This entry was posted in Above Average, Auckland, Brunch, Cafe, Causal Dining, Lunch and tagged Auckland Cafe, Auckland Restaurant Month, breakfast, Brunch, cafe, East Auckland, Howick, lunch, Smashed Avo, Urban in East, waffles, Zomato. Bookmark the permalink.